Thirty eight Spartans took part in Sunday’s Paul Maguire Memorial Handicap Five Mile race in Stevenage. Race winner REECE McCULLAGH completed the five miles a huge 5 minutes quicker than handicap to record a new personal best (PB) time of 33 minutes exactly, with JULIE SIMMONS in second position overall the leading woman with 41:30, 2:15 ahead of her handicap. ANDREW PATTERSON was second man (third overall) in a new PB time of 27:21 and SIMON JACKSON third man in 28:52. JOANNE BOWDERY was second lady in a new PB time of 40:08 just ahead of ZOE JACKSON with 44:14 in her first five mile race. Andrew Patterson was also fastest runner of the day with his 27:21, with Simon Jackson second quickest and Grant Ramsay third fastest. MARIE COLUCCI was quickest female in a new PB time of 36:56 with ISABEL GREEN second fastest in 37:30 and Joanne Bowdery third fastest woman. 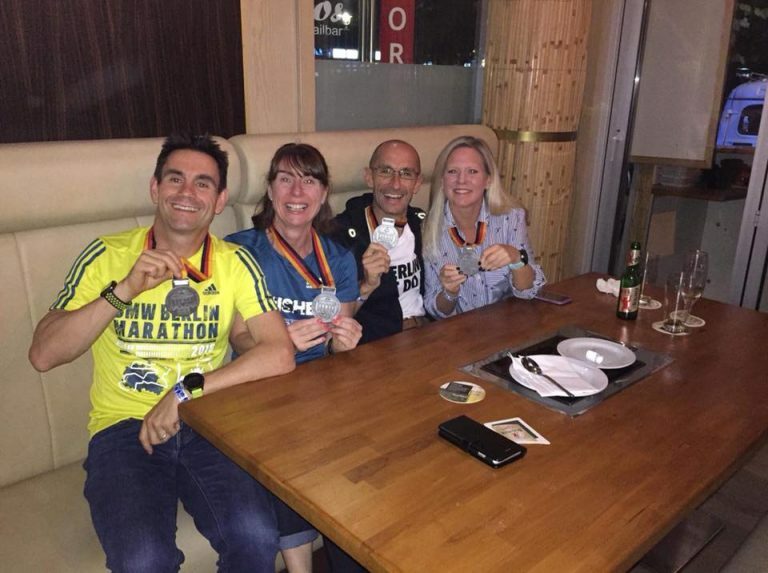 DANNY SCANLON 32:00, STUART ARCHER 32:55, SALLY PHILLIPS 50:30 and CAROLE SHELDRICK 43:52 all also improved their 5 mile personal bests, while there were season best improvements for PAUL HOLGATE (45:20) and KAREN PALMER (44:03), and year best improvements for JIM BROWN (40:07) and ROGER BIGGS (54:45). The event was first organised by Fairlands Valley Spartans in 2009 to pay tribute to Paul Maguire, who won the Stevenage running club’s Spartan of the Year award prior to his death in 2008 at the age of 42. This year the event was raising funds for Societi – the UK Kawasaki Disease Foundation. Fairlands Valley Spartans were not hitting the wall in Sunday’s Berlin Marathon. Although it was hotter than expected JENNY GARRETT ran a new PB (personal best) of 4 hours 14 minutes 6 seconds taking 4 minutes 26 seconds off her London time. 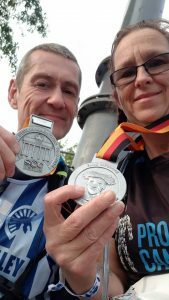 Trevor and KAREN BROOM also ran the marathon. It was TREVOR BROOM’s first full marathon since he started running 16 months ago he finished in 6.25.19. KAREN BRROM finished in 5.19.13 which gave her a 21 minutes PB. They are both so happy with that as it was hot sunny day. 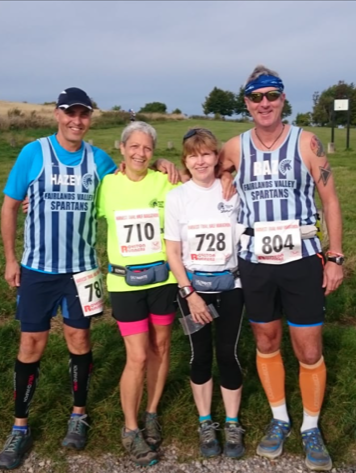 Trevor and Karen are both big success stories from the starter section of Fairlands Valley Spartans, which takes complete non runners to marathon running athletes. JACKIE DOWNES took seven seconds off her PB with 4.35:39. TIM SABAN went really well with 3.27:06 but STUART HAYCROFT was fastest from Fairlands. He finished tantalisingly close to the three hour mark with 3:00:38, which was a PB of just under 14 minutes. 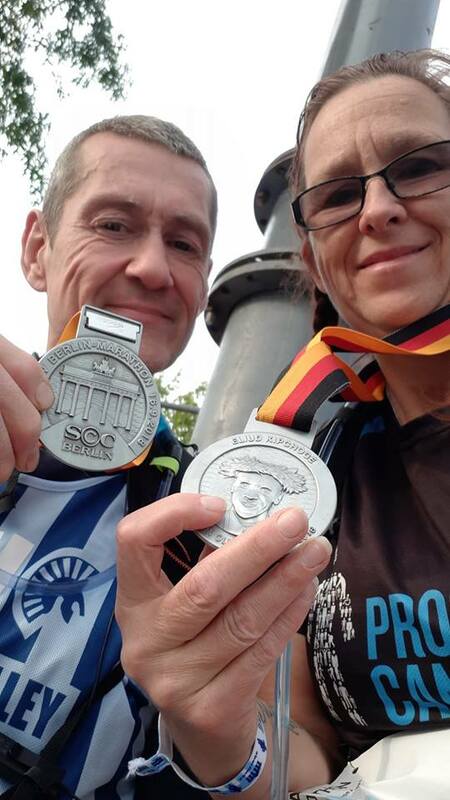 He said he loved the race, not just because it’s fast, but because the marathon takes over Berlin, the atmosphere and experience is unlike anything he has ever done. He said: This was my 12th Chase Sun since April and it was my PB – smashing my previous by 2:41. I felt like I was struggling in the middle after Tuesday night’s Surge Session but pushed on, keeping a steady pace and a sprint finish. Glorious sunset behind Olympic Park midway through. On a more general note the Tuesday night interval sessions at FVS (I only joined last month) have done wonders for my times and for my mental approach to running. ERICA GRAYSON said she had her second “great” run in eight days and commented the Great East Run was very hot. Well organised with a stadium finish. Amazing marshals but not enough first aid support. She stopped three times to help runners and twice participated in first aid. It was an undulating course with a couple of surprise hills. 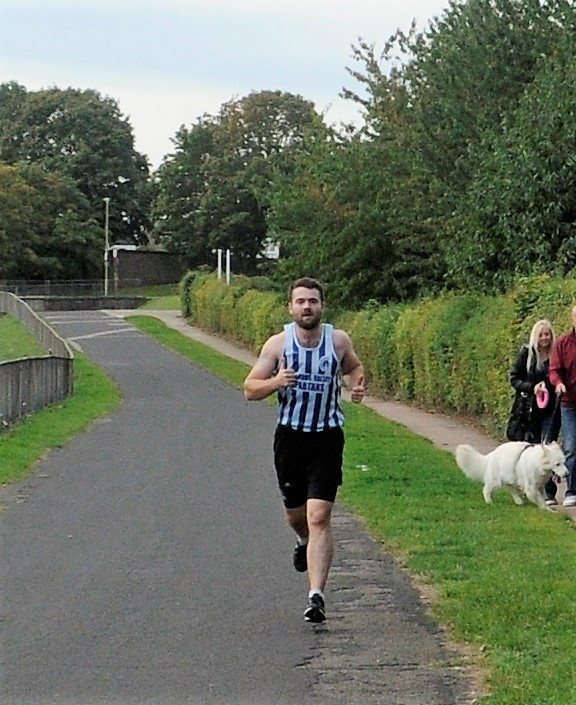 DAVE BOWKER enjoyed the Shelford 5K fun run saying it was a good course on traffic free roads and he finished 12th out of 292 in 20:21. The weekend saw 34 Spartans running five different Parkruns. In Stevenage there were three personal bests: Jonathan Jones (23.41), Nigel Strongitharm (23.46) and Michael Andrews (24.33). Steve and Isabel Green took a trip to a forest. Their times 21:07 and 28:42. Tom Sauka ran for the first time in Houghton Hall and came 7th overall in 20:51. In Letchworth John Harris was 6th (22:02) and Paul Jennings (28:36). John Roxburgh was in Ulverston Cumbria and finished in 11th position in 23:34. 1 REECE McCULLAGH 33:00 8 PB New 5:30 Overall winner. 1st 5.